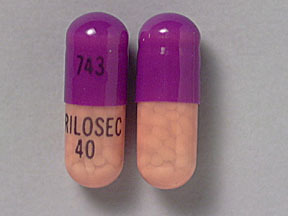 PRILOSEC is a brand name of omeprazole. It is a proton pump inhibitor which decreases the acid produced in the stomach. People purchase PRILOSEC online and they get the drug in two forms: delayed-release capsules and delayed-release suspension. Both the formulations are administered orally. PRILOSEC as delayed-release capsules is available in 10mg, 20mg and 40 mg strength of omeprazole in the form of enteric-coated granules along with inactive ingredients. PRILOSEC as delayed – release oral suspension contains 2.5mg and 10mg of omeprazole in the form of enteric coated granules, which are similar to the granules used in capsules. PRILOSEC as delayed –release oral suspension contains 2.5mg and 10mg of omeprazole in form of enteric coated granules, which are similar to the granules used in capsules. A patient may observe following general side effects like a headache, fever, nausea, vomiting, lack of hunger, stomach pain, flatulence and cold symptoms like sneezing, sore throat and stuffy nose. Patients buy PRILOSEC online as per their physician’s direction. However, they should disclose their other medication like antibiotics, blood pressure medications etc. to him that are been taken at the same time. This avoids any significant drug interactions if any. Concomitant use of PRILOSEC and antiretroviral drugs like nelfinavir, atazanavir should be avoided as it may affect the absorption of antiviral drugs. Concurrent administration of saquinavir with PRILOSEC or other proton pump inhibitor increases the concentration of saquinavir in blood. Thus it may lead to toxicity. PRILOSEC i.e. omeprazole inhibits gastric acid production. Therefore, drugs like atazanavir or ketokonazole, iron salts, erlotinib and mycophenolate mofetil (MMF) for which pH plays an important role are less absorbed. In the same situation, drugs like digoxin are better absorbed. Drugs like rifampin which are known to induce both CYP2C19 and CYP3A4 if concurrently administered with PRILOSEC may reduce the omeprazole serum level. Concurrent use of PRILOSEC and clopidogrel should be avoided. Concurrent use of PRILOSEC with methotrexate leads to elevated and prolonged levels of methotrexate and its metabolite in the blood which may lead to methotrexate toxicities. 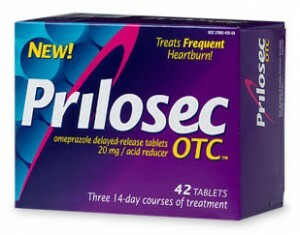 PRILOSEC i.e. omeprazole can prolong the excretion of drugs like warfarin (an anticoagulant), diazepam, phenytoin, cyclosporine, benzodiazepines, and disulfiram. Therefore doses should be monitored and adjusted. Herbal preparations with St.John’s wort (Hypericum perforatum) may interfere with PRILOSEC. Concurrent use of PRILOSEC and tacrolimus may increase the concentration of latter in serum. PRILOSEC i.e. omeprazole is likely to get excreted in human breast milk. Therefore, a nursing mother should use this drug under strict medical supervision and prescription. If any adverse symptoms or allergy are observed, she should contact her physician immediately. The safety and efficacy of PRILOSEC have been proven in children of one to sixteen years old for short-term treatment of GERD and erosive esophagitis due to acid-mediated GERD. However, the use of the drug and its safety is not reported for infants less than one-year-old.